I stay in Singapore at least once a year as Changi Airport is such a convenient travel hub. Over the last couple of years I have been wondering, “what is that thing being built at Marina Bay?” The answer is the Marina Bay Sands. 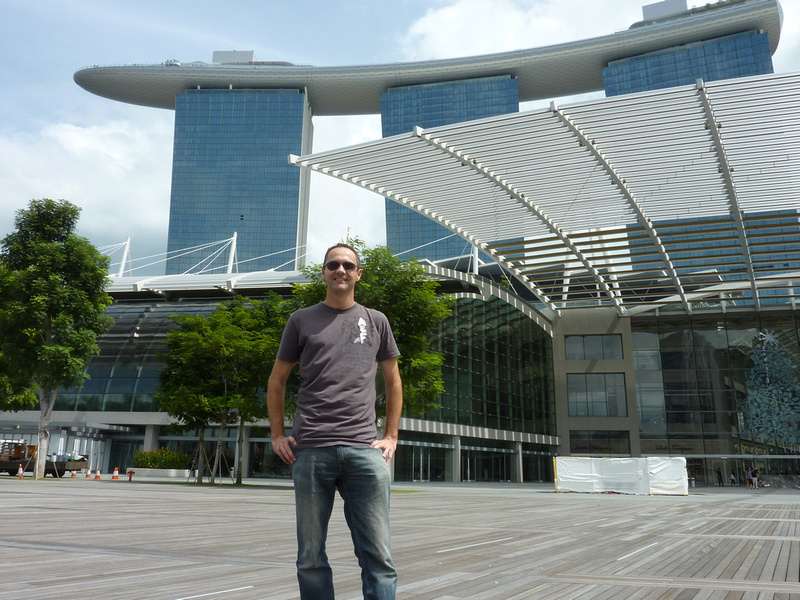 This was my first trip to Singapore since its completion, and I was invited to stay for the night as a guest of the hotel to have a look around for myself. The hotel is one part of an integrated resort, which includes a casino, shopping mall, theatre and convention centre. The MBS looks across Marina Bay and has an unobstructed view of Singapore’s financial district skyline. The hotel accommodation is five star luxury at its best, with 40 inch TV’s, automatic curtains and luxurious beds that make you to never want to get out of bed again. While I appreciated having a luxury king size bed, I was equally impressed with the reading couch. Getting horizontal on a couch and reading a book is a wonderful way to relax, and if I had time I would have lay down on this all day. As it was I was Singapore for just over 24 hours, and I had much work to do. Plus there was another couch I need to look at, on the roof. Amidst all the trimmings of 5 star luxury, the stand out highlight of this hotel is the pool. This is not some body of water tucked away in a sweaty little room on the second floor. The pool is on the roof. All three roofs. And then some. This is the most ridiculous swimming pool I have ever seen. 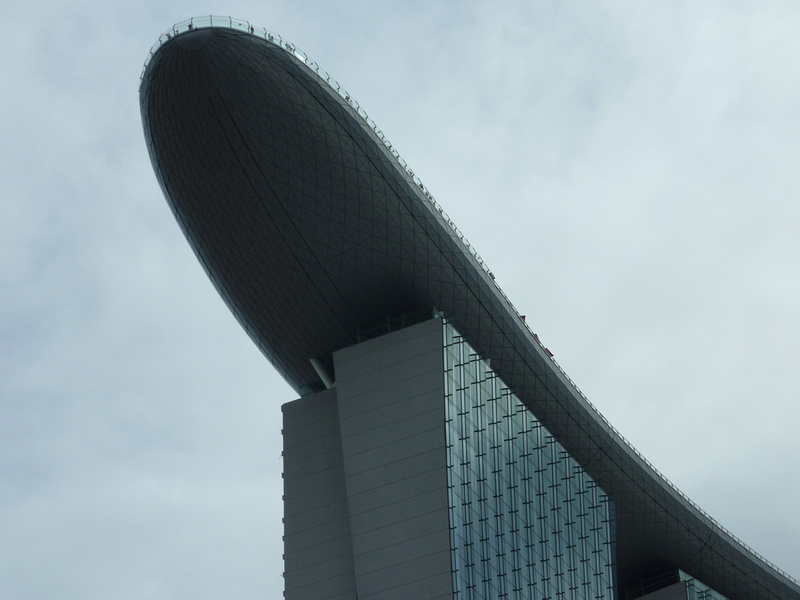 That spaceship parked on the roof of the hotel is the SkyPark, which is 340m-long. 67 of those metres overhangs the north tower, making it the world’s largest public cantilevered platform. 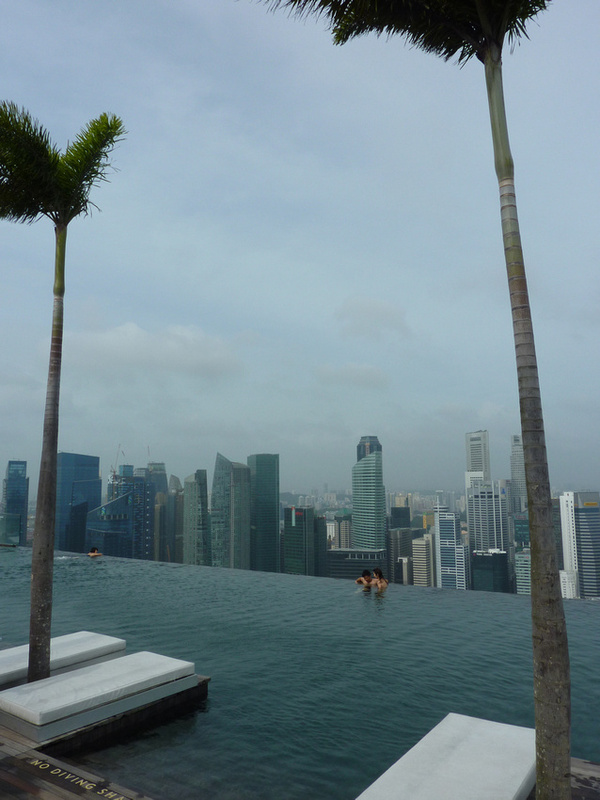 The showpiece of the SkyPark is the 150m infinity swimming pool. 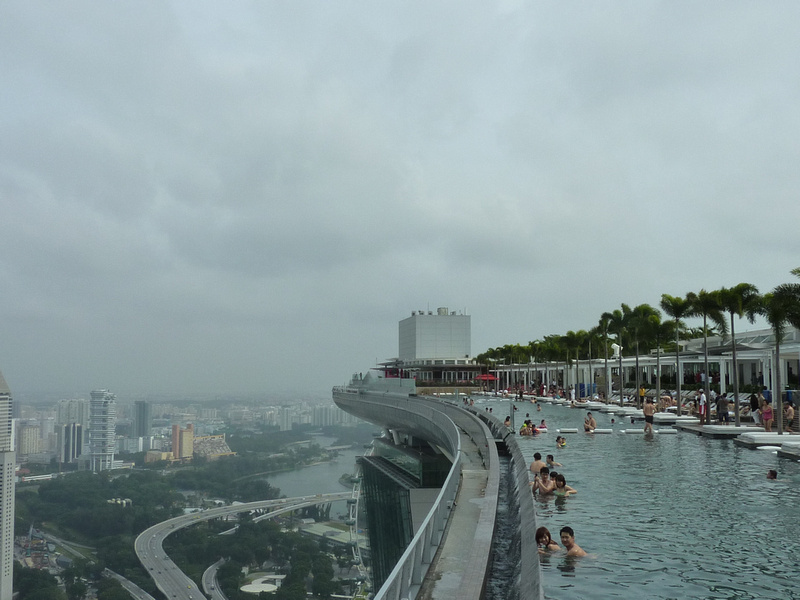 There is a night club and bar at the SkyPark, which is open to the public, but only hotel guests can swim in the pool. I thought that I might get some vertigo in the pool, but I didn’t feel that at all, even swimming up next to the edge. The SkyPark is 191 metres above the ground and it felt a few degrees cooler up there, though that might have been the wind blowing off all that water. I love this pool. I had every intention of having a morning swim and then heading over to Little India for a lunch time curry. I ended up lingering for longer than I planned, so I missed my curry. I figured that I’m not going to be staying in such luxury on my next trip to Singapore, so the curry will have to wait until next time. I think I made the right choice. From a design point of view I find this hotel fascinating. The cantilevered deck is an engineering marvel. I like looking up at it from the ground as it looks like a zeppelin is parked on the roof. 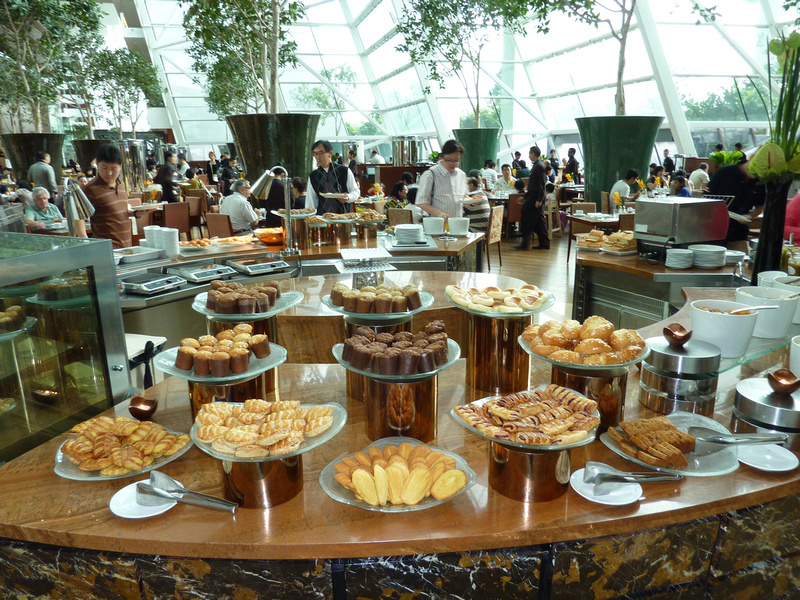 The breakfast buffet was a decadent as I expected, with western and Asian breakfasts options available. 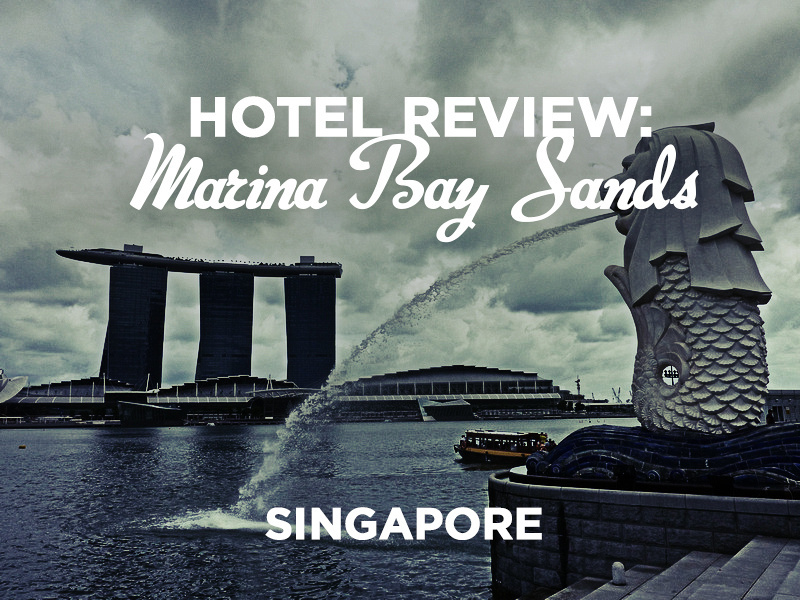 Marina Bay is reclaimed land and there is more construction going on in the area. There is a metro line being built nearby, and behind the hotel the Gardens by the Bay is nearing completion. It will be interesting to see how the area looks once everything is completed. 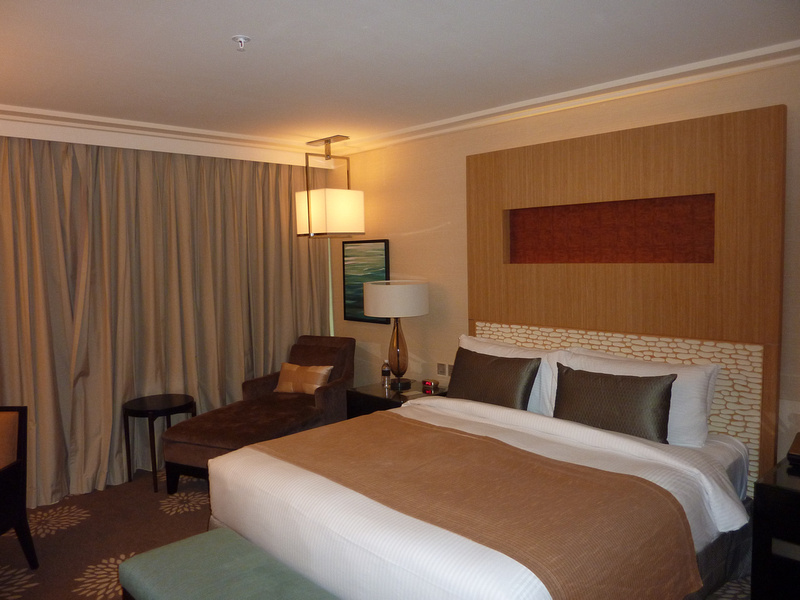 Check the rates for the Marina Bay Sands Hotel Singapore online. That pool is the coolest thing ever. The first picture of the pool is pretty scary. It looks like it’s really the edge but then when I saw the second picture of the pool at the Sky Park, I calmed down a bit because there was space before the edge. That is a really cool pool. I’ve never seen anything like it. I also like the view from down below. That is really great architecture. I was first concerned about how close it would be to the edge as well. It is a good distance away from the edge. That building is really cool, I remember the first time I saw it in Singapore I was amazed! And I really want to go swimming in that pool! 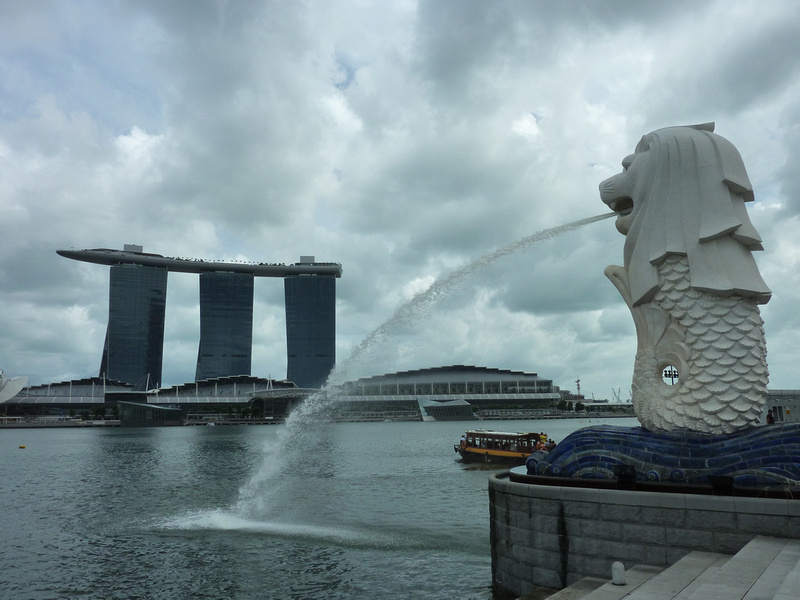 I loved Singapore, the Lion City! I went there already and I enjoyed it. I would want to go back if given the chance. and I think you’ve given me the reason to. I would so love to visit that place. And that pool! It’s so unique, I want to check out the edge! Wow, talk about an infinity pool! Great photos, thanks for sharing. I would love to stay there even just for one whole day! The infinity pool is inviting. because its such an iconic building as a guest were you faced with queues and large crowds. Did you have to wait long periods of to be seated for breakfast etc? Om – Surprisingly there wasn’t any queue for breakfast. I found a table right away and helped myself as needed. Ha. I think I’d need a week there! This would have to be the best hotel infinity pool in the world.